Brothers Roofing holds itself to extremely high standards in quality. We pride ourselves on our use of innovative products like seamless Frieze Boards. 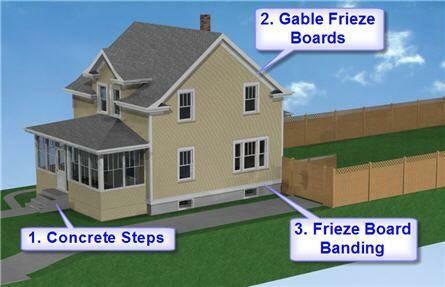 Brothers Roofing is one of the only companies in the U.S. offering seamless Frieze Boards. Seamless Frieze Boards is also a trim detail, usually 1" x 6" , 8" , or 10", installed horizontally below the soffit, which is the material used to enclose the horizontal underside of an eave, cornice or overhang. Brothers Roofing uses a seamless steel PVC coated coil of metal, with several colors to choose from, roll formed to the exact size and length of your Frieze boards. This can be done on new construction homes or remodeled homes. Typical Frieze board is 10' lengths of aluminum that overlap and warp in heat and develop lap abrasion.